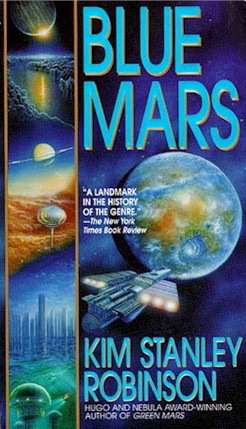 Blue Mars is the third novel of the Mars trilogy, published in 1996. The scope expands greatly compared to the first two volumes, both in space and time. It follows the characters we have come to know and love as Mars achieves independence and social justice and is successfully turned into an Earth-like planet that sustains life, while humanity colonizes the solar system. Ann is confronted to the most radical wing of her Red movement, the Kakaze, in the wake of the revolution. She exhorts them to stop «ecotage» on the terraforming infrastructure. She also dissuades them from bringing down the space elevator at Sheffield. She shows signs of changing her point of view toward acceptance of the fact that Mars has been colonised and has changed, although she remains committed to the preservation of its primal state. Sax seeks to understand Ann’s point of view. He makes a deal with her, to send the orbital mirrors away so that the terraforming is slowed down. He has an accident and learns that Hiroko is alive. As much as Ann seems to be moderating her «Red» point of view, Sax is moderating his «Green» stance that Mars should be transformed to suit human needs. A great constitutional conference is called during which all kinds of issues are addressed, for instance economic reform and the environmental issue. Art acts as a talented mediator between all the actors represented on Mars: cities, settlements, political groups, metanationals. Meanwhile, on Earth, the aftermath of the great flood has led to turmoil and chaos. A Martian delegation headed by Nirgal (accompanied by Sax, Michel and Maya) arrives, charged with negotiating the terms of Martian autonomy with the Terran authorities. They arrive in Trinidad, but soon fly to Bern, Switzerland. Nirgal discovers the Earth’s primal beauty in the Alps, then follows a lead according to which Hiroko is somewhere in England. Michel returns to Provence. He is given a tour during which he recalls his previous life and grieves at the changing face of the Camargue. Although Michel takes time to convince her, Maya eventually rejoins him and they visit Arles where she seems to genuinely appreciate the surrounding landscape. Unlike Maya, Michel feels that he has returned home and is not excited at the prospect of going back to Mars. This short section follows Ann as she continues her pilgrimage in the Martian landscape, coming to terms with the changes that she witnesses. She meets Harry Whitebook, an «animal designer» responsible for the introduction of polar bears, among other species, on Mars. She then convinces a group of Kakaze not to attack Whitebook’s rover and killing him. Nadia reluctantly accepts the post of President of the Martian Executive Council. She is opposed to Jackie Boone in a series of cases, as it becomes more and more obvious that the most powerful institution under the new Martian system is the Environmental Court, headed by moderate Red Irishka. The Earth delegation returns, sparking a debate about the terms of the treaty, most notably on immigration. The section closes on the selection of a site for the new capital. Nirgal is confronted by Jackie on the terms of the Earth-Mars treaty he negotiated, while the Chinese are flooding the Red Planet with new immigrants. Nirgal hears rumours that Hiroko might hide somewhere in the northern region, and pursues her ghost everywhere before deciding to settle in a cirque and become an «ecopoet». He exploits a large patch of land, and sees nature blossom (plants and animals like marmots) despite a viroid spreading through the potato seeds. The section closes with a massive dust storm that destroys everything. Sax settles in Da Vinci, where a group of scientist led by Bao, a genius female mathematician, experiment with the latest mathematical and physical theories. Sax wanders around the region, reflecting on the changes and making scientific observations. Michel comes and visit him, tells him he wants to return to Provence. They talk about Ann once again, and discuss the concept of areophany. New technology will shortly allow starships to link Earth with Mars in three days only. The section starts as Nirgal trains for the Round-the-Worlder, one of several Martian marathons. He adheres to the ‘religion’ of the lung-gom-pa: running as meditation or prayer. In the course of his wanderings, he hunts antelopes, meets hunter-gatherers reminiscent of African or Native American tribes, and flirts with a flying woman, the diana, who turns out to be Jackie Boone’s daughter: Zo. This section is preceded by a long expository fragment capturing the wide range of changes that are affecting Humanity, a period known as the Accelerando (or diaspora): new economic theories, threats of overpopulation on both Mars and Earth, expansion pretty much everywhere in the solar system (Mercury, Saturn, Jupiter, Uranus, the asteroid belt). Zo, Jackie Boone’s rebellious daughter, embarks on a series of diplomatic missions to the new colonies on Mercury and Miranda (Uranus’ biggest moon) in order to forge an alliance against Earth’s disproportionate influence. She comes out as condescending with regard to Mercury’s rigid society, but also with the First Hundred and the previous generations. She also visits Venus and Earth, where she looks down upon the overpopulated slums of Calcutta. She also visits Crete. Her return on Mars is a relief, but as she goes flying she has an accident and dies. Michel is still preoccupied by Maya’s condition. Seeking to rekindle her memories, he embarks her on a trip to Burroughs (now underwater) and the Hellas Bassin where she spent the best days of her life. They attend Spencer’s funeral, and reflect on the extent to which areophany has changed them. Sax continues his research to counter the effects of senescence in the First Hundred. He works at a laboratory in Acheron, where Maya also lives since Michel’s death. They reflect on the change that Mars has undergone, the colour symbolism being an important motif here. Sax then leaves for Olympus Mons, where he meets Ann. The section ends with a massive storm in which they become embroiled, they turn out fine, and closer than ever. Ann has made peace with Sax. Now she makes peace with herself, and learns to accept Mars as it is, as she witnesses the utopian society that has been built around her. The book closes with a scene on a Martian beach, calm and serene, some of the last surviving First Hundred surrounded by children, symbolising the dawn of a new era. [Zo:] "You’ve located intrinsic worth in the wrong place," she said to all of them. "It’s like a rainbow. Without an observer at a twenty three degree angle to the light being reflected off a cloud of spherical droplets, there is no rainbow. The whole universe is like that. Our spirits stand at a twenty three degree angle to the universe. There is some new thing created at the contact of photon and retina, some space created between rock and mind. Without mind there is no intrinsic worth." (pp.435-436, Viriditas).